April 25 is Anzac Day, a day on which New Zealanders and Australians commemorate the casualties of wars. Many places in the country feature a “War Memorial Library”, “War memorial Hall” and so on. New Lynn has its Memorial Drive, with adjacent Memorial, and War Memorial Library. Here are some pictures of the Memorial. 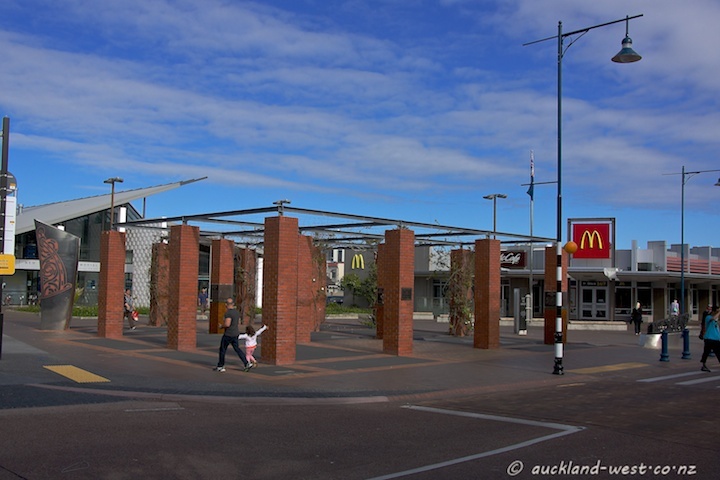 “A grid of brick pillars reflects the industrial history of New Lynn and carry both the RSA memorial plaques and support red and white roses (for peace and love). The roses will eventually form a canopy over the square. 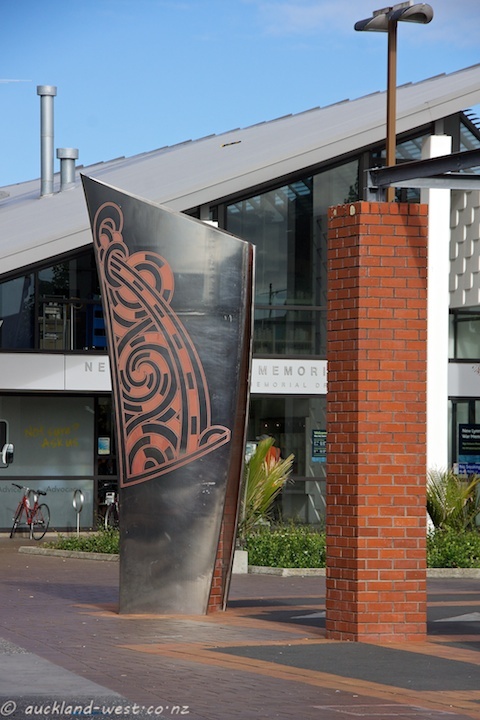 A diagonal line of Totara inserts across the square creates a spine and emerges at either corner as a free-standing canoe prow and stern. 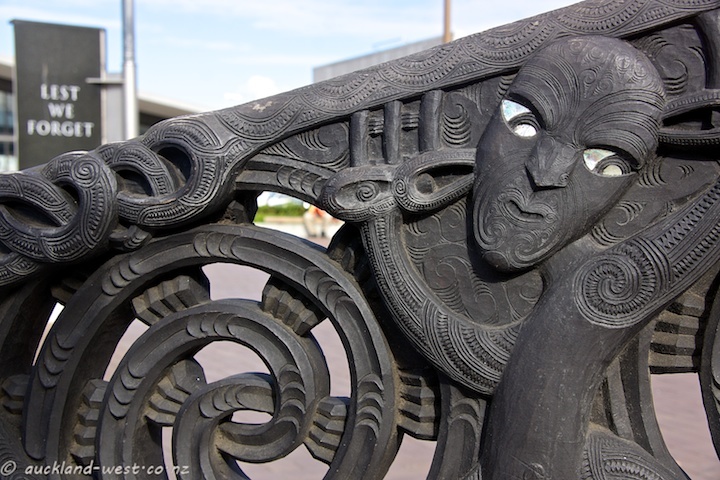 These artworks were designed and carved by the Matariki Carvers, (Te Kawerau a Maki). 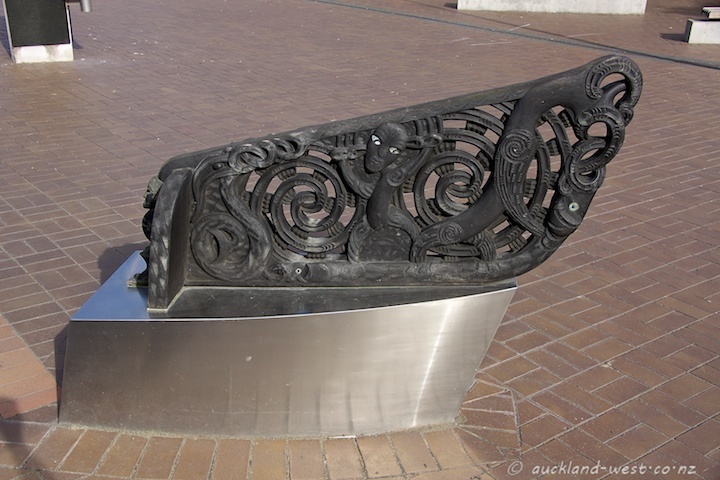 The prow is a fine traditional carving in kauri set on a stainless steel base; the stern a stylised, stainless steel structure that has been etched in a red earth colour with a traditional design”. I personally have some difficulty to view the memorial square as an integral monument, but appreciate it as a well-functioning community square (“not easily read as a cohesive designed landscape in its present form” as per the above mentioned inventory) – and I really like the individual components. The bottom picture tries to convey an overview, with the prow barely visible on the right (the War Memorial Library in the background, left).